Our B&B is conveniently located - perfect for exploring our city on foot or taking to the roads and exploring NB for the day. Our walking trails extend for 88 kms within the city limits - walk, bike or run. Can we help you plan your stay? Our rooms are spacious, comfortable and designed to fit your personal or business needs. Desks, chairs and reading lamps ensure you are comfortable. We offer free Wi-Fi and free off-street parking. We want you to have all the comforts of home. NB 4-Star Canada Select hospitality at its best. ensure your stay is the best it can be. Book on our website (right above this) and save 5%. Discount is added at check-in. Be sure to let us know you booked on the website for discount to be added! ​but you'll stay for our breakfast! Our view of Fredericton's beautiful downtown skyline is the most photographed location in the city. 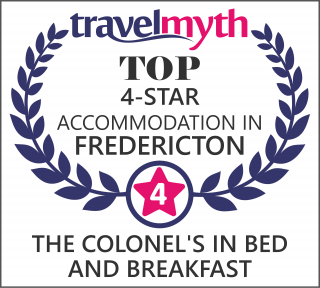 From The Colonel's IN Bed and Breakfast property, enjoy views of spacious Carleton Park, our city's extensive walking trails, the St. John River and the Fredericton "Green". We are ideally located to walk to and enjoy the city center. Where do you want to walk to today? Fredericton Convention Centre. No need to worry about parking! Each B&B guest room is spacious and comfortable with a four piece ensuite bath. You'll enjoy our hot and homemade four course breakfast to get your day started.